SANTA CLARA, Calif., September 14, 2017 ― Renesas Electronics Corporation (TSE:6723), a premier supplier of advanced semiconductor solutions, and Cogent Embedded Inc., a leading embedded software provider to the automotive industry, today announced their joint development of a 3D surround view solution to assist drivers during parking or low-speed maneuvers. 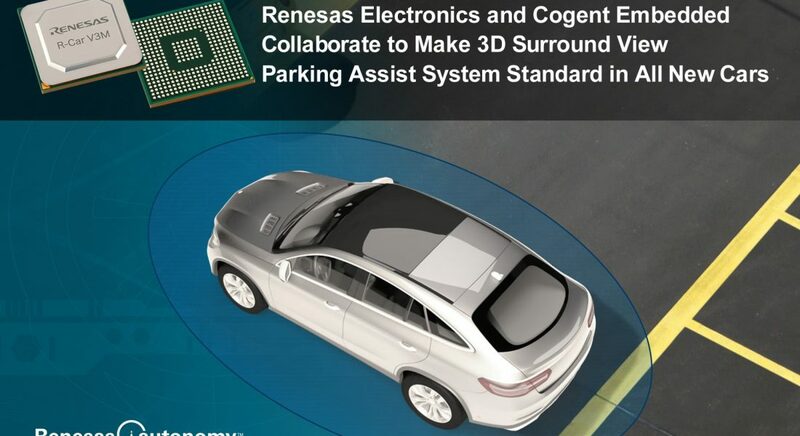 Designed for parking assist systems in entry- and mid-level cars, the new solution combines the Renesas R-Car V3M system-on-chip (SoC), an SoC optimized for smart camera and surround view systems, with Cogent’s customizable 3D surround view software on a reference board. By using this solution, OEMs and Tier 1s can quickly customize and create their individual 3D surround view parking assist systems. On-demand customization services can also be provided by Cogent Embedded to enable system developers to concentrate on developing application software to differentiate their systems.